Who Loves Toy Elephants? Who Doesn't? Take Ellie the Toy Elephant into Your Toddler's Habitat! Elephant toys are always a favourite, there something about a big, slow animal that just delights the imaginations of quick little people! There's nothing cuter than a toddler or pre-school kid bouncing on a Zooba. Seriously, it's the cutest toy for kids since the Jolly Jumper. 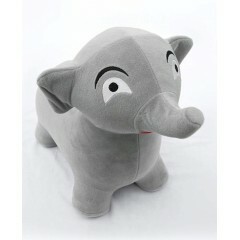 Ellie the Elephant is one of our cutest ride on toys. His plush ears, soft pelt and gorgeous trunk will delight your little boy or girl while helping them to develop core strength, coordination and concentration. Did we mention Ellie the Elephant will also really tire them out! Bonus! Like all Zooba inflatable bouncy toys, Ellie is made to last from only the highest quality materials and carefully manufactured. He's safe for supervised use by kids up to 60kg. Why not bring Ellie the ride on inflatable elephant toy into your kid's habitat. Check out our tiger toys, zebra toys and even a ride on dog toy – have your own bouncy menagerie at home!